Home » Scooters » Mobility Scooter » Go-Go traveller Review – What are the benefits? From our Go Go traveler elite review, we came to the conclusion that this lightweight, foldable and highly portable 4-wheeled electric scooter is a good traveling companion. What you get is an affordable, sturdy, high-quality product with good maneuverability. Suitable for most people within the max weight limit and a cheap price to pay. Same model as can be found for hire on most cruise ships. What makes the Go Go Traveler Elite a viable mobility scooter option? Package received in good condition and the assembly process was a breeze. The product description claims that it shouldn’t take more than 60 seconds to assemble the scooter and I think we did it in that time, give or take a few seconds. The design isn’t groundbreaking and even though there are better mobility scooters available the Go-Go traveler does suit very well for specific purposes. It has its features like the front basket which is great for carrying gear/groceries, a well-cushioned seat which has a hole in it to increase airflow and reduce heat. The seat itself is highly adjustable in height and gives you great comfort while riding. The tires might be a bit smaller than on for example the Hummer XL, but on firm terrain, there is little to no difference in comfort. 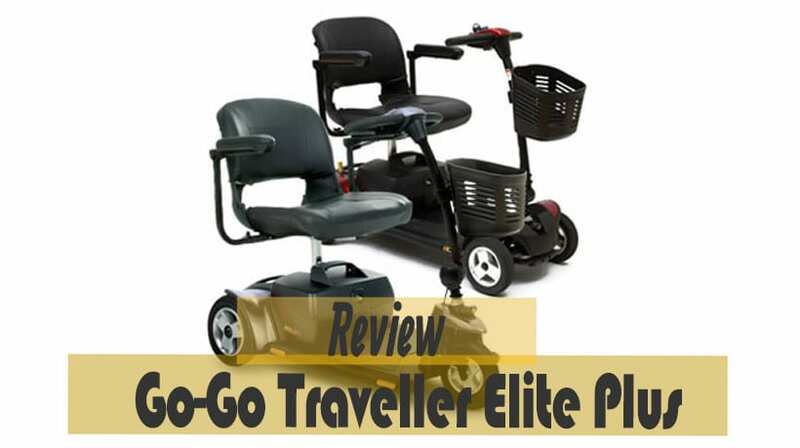 The best part about the Go-Go Traveler Elite Plus is its 4-wheel base which provides good stability. For a 4-wheeled electric medical scooter, the Go-Go Traveler is lightweight and can be dissembled into 2 pieces with the heaviest piece weighing only 40 pounds. A mobility scooter that is loved by its former customers and you can easily understand why when you take it for a spin for the first time. It’s another great scooter and from a renowned brand in the business, Pride Mobility. The scooter is easy to maneuver and has a decent turning radius and the ability to reverse. Going grocery shopping with it is a blast and even at the tightest spots in your store, the Go Go traveler will get through without a problem. Taking it with you is even easier than the assembly process. It takes about a minute to disassemble and load it into the trunk of your car and you’re ready to go. It lacks suspensions so while riding on gravel, lawn or other rough surfaces it gets a bit too bumpy for my taste. It weighs around 113 pounds all together which is somewhere in the middle on the weight scale of scooters. One of our favorite picks for seniors. One thing we noticed is that the ground clearance is only 1 ½” under its lowest parts which are a little disappointing. This could eventually cause trouble for someone who has high thresholds at home or going to some places where they are present. Make sure to check your own thresholds before purchasing one in order to know that everything is going to work out okay. The Go-Go traveler is best suited as a short range multipurpose scooter for travel, small grocery runs, or to be used as an indoor scooter. It provides good comfort with great riding capabilities and is available as both a 3- and a 4-wheeler. Also, read our review of the Drive Medical Scout which is an immensely popular and cheap electric mobility scooter. Drive Medical Scout review - Is the budget mobility scooter any good?